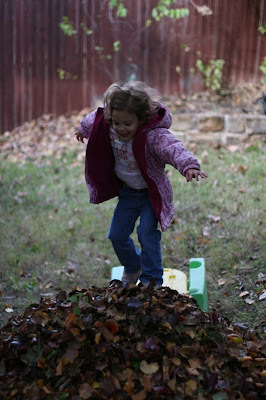 Silly Mommy : Goodbye fall. Hello leaves. 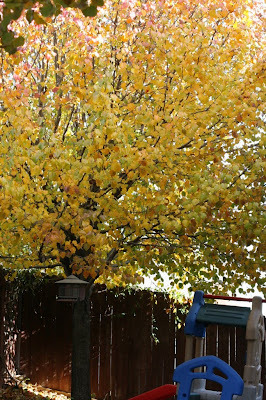 I love the trees in our backyard. You can see every season in them. My favorite is when they turn bright yellow. 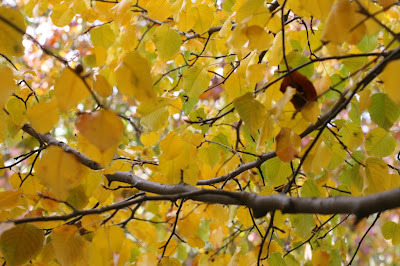 When I looked out the window on this day, I had to grab my camera and run outside:) Its just so beautiful. There isn't a whole lot of nature where we live, but this is enough to make me happy all week long. 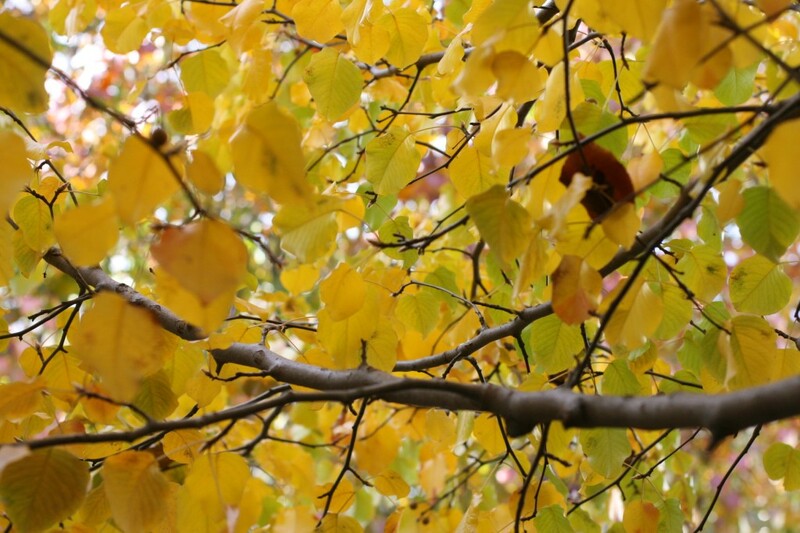 With fall quickly fading away, the leaves have changed and now we've got a whole lotta leaves to rake up. 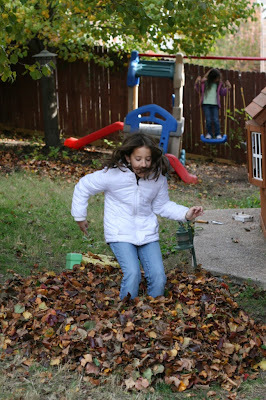 These pictures were taken during Round 1 of raking a couple of weeks ago(actually these were from the beginning of the month before the leaves turned totally yellow). 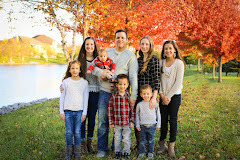 We have since raked another time. . .well, when I say we, I guess I mean Joey and the kids. I got the baby:) And the last leaves fell off the trees just last week, so we've still got a lot of leaves back there. You could swim in them there are so many. The trees are now "naked" as we call it. 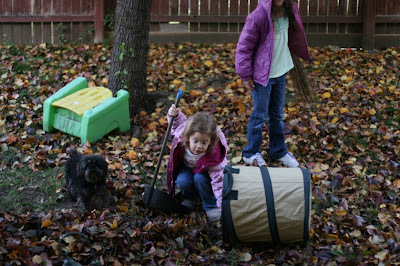 No more pretty leaves:( The girls love helping their Dad and being outside. 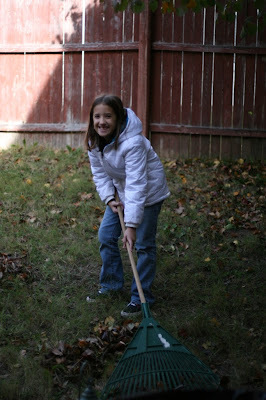 And strangely enough, they don't even use a rake half the time(since we only have one rake, they take turns). They use whatever they can find in the garage to help:) And Zac, well, he supervises. I like to watch my kids work. Sounds mean, but its good for em. And when they are working together, it brings them closer together. I remember that as a kid. Picking weeds really wasn't so bad when I had my sister and brother there to talk to and joke around with. Don't you just love what they are using? 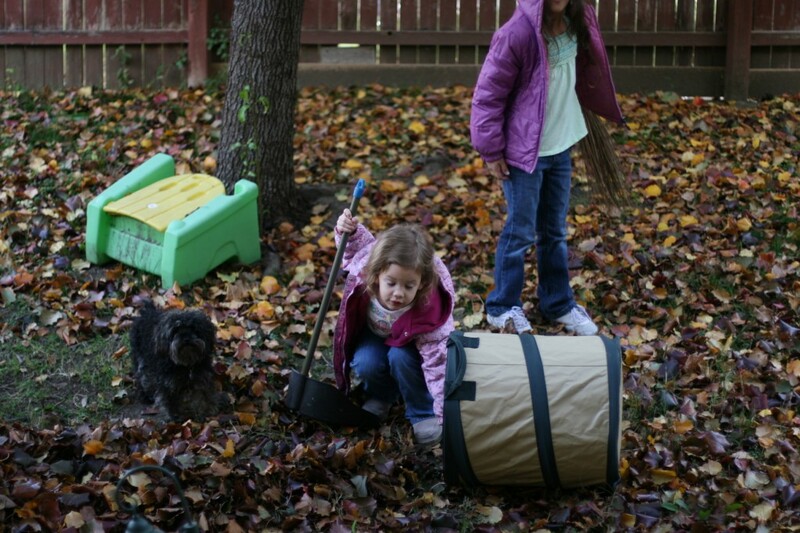 Ella has this sweeper thingy and Cali has a dustpan. And now for the really fun part: jumping in them! Goodbye fall. You were fun. Now we're in the bitter cold of winter. But I like winter, Texas winter that is. Pretty mild compared to most places. Today we were in the 60s, which was nice. But we have a chance for snow next week-whee! (Its exciting for us Texans:) It actually gets pretty cold in North Texas though, enough to snow a couple of times a year. And thats perfect for me. I think I'll just sip my hot cocoa and sit by the fire with my honey all winter long. Love these pictures I love the seasons well the little bit that we get anyway. 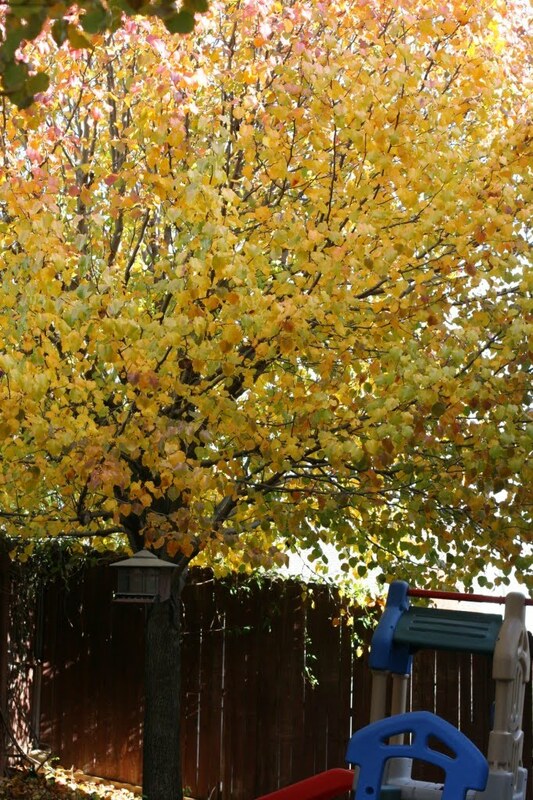 I told Joe the other day is Mike's tree turning like red/orange am I seeing things? I love seeing the girls not only working but having tons of fun good job girls and hey Zack great job supervising your my kind of supervisor. 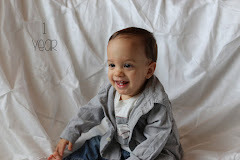 Ammon enjoy the rest sweet boy so precious just love your profile picture to the right there young man. Great fun by all is obvious. OK as a sidenote the "secret word" is actually kinda funny it is "sychoto" what the heck is that a little this side of crazy? What fun pictures. I wish that I had your girls here to help us. 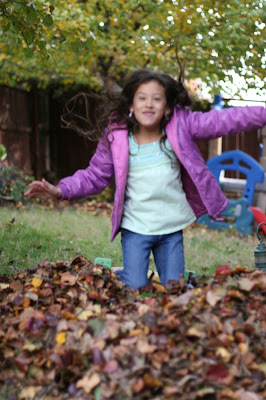 We had all the leaves raked up when we left for Utah but we got home to find our yard and patios full of them. 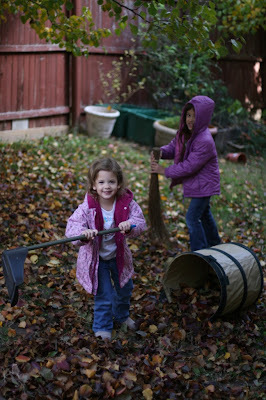 Love it that here in Texas we are raking leaves in January! !